The A Circuit is the top of the top when it comes to horse showing. It's a world with its own rules and super-privileged lifestyles. Teens employ private tutors so they can travel the circuit all year showing horses that cost as much as some people's homes.Tommi, Kate, and Zara are all elite competitors on the circuit, but they come from totally different backgrounds. Tommi is a billionaire heires… s trying to prove she has real talent (not just deep bank accounts). Kate puts the working in working student-every win has been paid for with hours of cleaning stalls. She's used to the grueling schedule, but Fitz, the barn's resident hot guy, is about to become a major distraction. And then there's Zara. She's the wild child of a famous rockstar, but she's ready to take riding seriously. 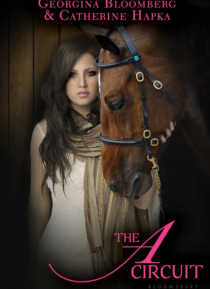 Can a party girl really change her ways?Readers who enjoy peeking into the elite world of series of Gossip Girl or The A-List will feel right at home in this new series with its friendships, drama, and privilege set against a backdrop of competitive horseback riding.